A little over a week has passed since Grubhub announced the acquisition of LevelUp, so we’ve had some time to reflect on the deal. Previously, Grubhub typically acquired regional brands (i.e. Foodler, OrderUp, Eat24) that mimicked its own business model — connecting restaurants with diners via a marketplace model. LevelUp though has no delivery business at all, and is most well known for being one of the only reasons why Americans use QR codes (aside from Starbucks). So what’s behind the deal? The key is to understand Grubhub’s playbook for smaller restaurants, and why they’re building a new one as they strike partnerships with larger brands. If you’re in the restaurant industry, there’s a good chance you’re familiar with the situation on the left. For the unfamiliar, these tablets present a massive problem for restaurants. The point of sale (POS) is the center of a restaurant’s operations. It’s the cash register, the ingredient tracker, and even the marketing center. Unfortunately, these tablets are totally cut off from the POS; if orders do make their way in, it’s because someone manually enters them, day after day. Some companies are addressing tablet-sprawl, including Checkmate, Chowly, and (recently acquired by UberEats) OrderTalk. 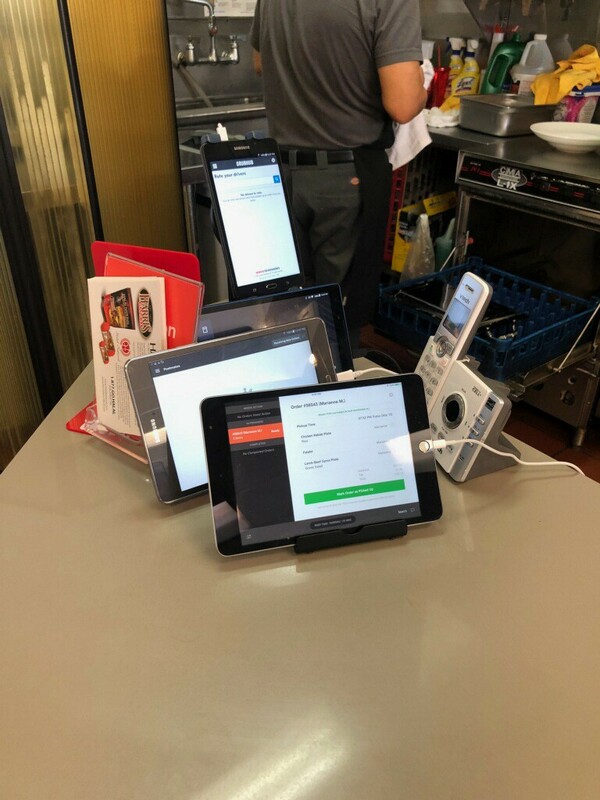 They automatically collect order data from the tablets and integrate with various POS providers to directly transfer the order information. Grubhub itself has sought to fix this problem for some time, but the POS market is hugely fragmented (this article counts 114!). 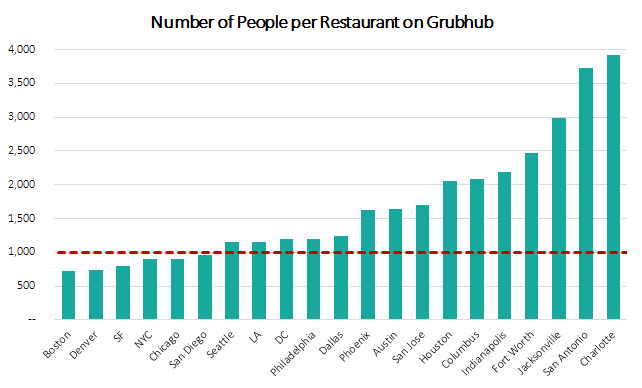 If this wasn’t enough, most of Grubhub’s 80,000 restaurants on its platform were smaller brands, making it hard to find an “anchor point” in terms of which POS integrate with first. In the past 12 months though, Grubhub has announced 5 major restaurant partnerships, including its exclusive deal with Yum! Brands (owner of Pizza Hut, Taco Bell, and KFC). These large brands thrive on efficiency, rooted in delivering a consistent experience to customers across their hundreds (or even thousands) of locations. They’re mini-factories, each with their own quirks, but operating under a unified brand name; putting tablets in the store — and the associated operational headaches — just wasn’t an option. Grubhub has made strides on its own, announcing integrations with cloud POS upstarts like Toast and Breadcrumb. But individual progress was always likely to be slow and steady. The LevelUp deal though materially accelerates its integration pipeline, adding >25 POS providers in one fell swoop. This immediately removes one of the major hurdles for other large brands to adopt digital ordering, and best positions Grubhub as the partner of choice. For smaller restaurants, offering delivery can seem more like a drug addictionthan a partnership. They don’t have the scale or brand power to control the customer to the same extent as large brands, and therefore lack the ability to dictate terms to third-party providers. As a result, the recourse for many is to simply choose their Grubhub tier (typically 20–30%) and hope that the orders roll in. Larger brands though are more immune from this effect, and Grubhub knows this. Even before the delivery wave, these brands benefitted from and have successfully scaled the customer relationship, allowing them to maintain their brand identity. And similar to how large brands won’t accept tablet sprawl, they’re also resistant to restricting their delivery operations to 20–30% fees on every order. Hence, the attractiveness of LevelUp’s white label business, who’s sole purpose is to build digital ordering apps for other brands. The look and feel are native to the restaurant, but the tech is powered by LevelUp. By owning this tech, Grubhub now can position itself as a partner to larger brands, providing digital ordering capabilities outside of its core “demand generation” marketplace (i.e. what a diner sees whenever they pull up the Grubhub site). They can own their traditional third-party order pipeline to these brands, as well as the first-party pipeline. What does it mean for restaurants? It looks like we’re in that phase of Grubhub’s growth where they’ve solidified their foundation with smaller restaurants (think <20 locations) and are now refining their playbook for larger brands. In terms of timing, this makes complete sense; online food ordering may not seem like a new phenomenon (Seamless and Grubhub were both founded >15 years ago), but we’re at a tipping point in the market as large brands everywhere (McDonald’s, White Castle, IHOP, Popeye’s) are all seriously evaluating their delivery strategies. And Grubhub wants to make sure it has all the tools at its disposal to make the operational transition for these large brands as seamless (no pun intended) as possible. I’d wager prices will go up for the white label product, especially as the company develops apps for larger brands that 1) need to support more users and locations; and 2) actually have the ability to pay more. There’s still a long road ahead for online ordering — only 5% of the $200 billion in restaurant takeout spending is online, and most major markets are still relatively small — only 6 of the top 21 cities have more than 1 restaurant per 1,000 people. With respect to Grubhub and LevelUp, we think the POS integrations and white label business are the first steps. There has been some mention of potential “restaurant-facing tools”, or even integrating a points-based loyalty + rewards system for Grubhub users (similar to the Starbucks app). Grubhub has admitted that these initiatives are likely a long way off still. Regardless, with this deal, Grubhub is evolving its restaurant acquisition playbook, signaling where it believes it sees the future of the online ordering market. Get closer to your customers, and grow your business.